The two winning Oscar women, Julianne Moore and Patricia Arquette, both had points to make when they accepted their Academy Awards. 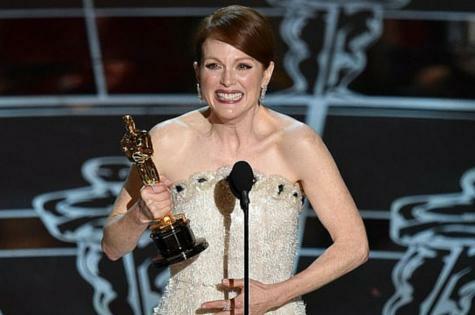 It's no surprise that Julianne Moore won her first Best Actress Oscar for her title role in Still Alice. Not only is it fifth time lucky for the versatile actress, but it's also a role that resonates with so many people - the advance of early onset dementia (specifically Alzheimer's Disease), in Moore's case in a woman who is also a professor of linguistics. Three years ago, the Academy of Motion Pictures awarded Meryl Streep the Best Actress award for her role portraying Maggie Thatcher's decline into dementia also. In a year of fantastic performances from nominees in both the actor and actress categories as well as Best Picture, Julianne Moore's was a standout. Prior to the Oscar, she had already won the Golden Globe, a London Film Critics' Choice Award, Women Film Journalists' Award and the British equivalent of the Academy Award, the BAFTA's. Accepting the Award, Moore said that she prefers stories about real people, real relationships and real families. "This movie had all those things in it," she said after the ceremony. She also confessed that her husband had told her she would win the Best Actress award. "He was the first person to see the movie. He went to watch it with me. When we walked out of there, he said, 'You're going to win an Oscar.' I couldn't believe it." She said that she hopes that people think more about issues such as how we care for and treat people with conditions such as dementia. The winner of the Best Supporting Actress, Patricia Arquette, used the opportunity to advocate for equal pay for women. Arquette won for her role in Boyhood. "Equal means equal. The truth of it is the older an actress gets, the less money she makes," she said. "It's inexcusable that we talk about equal rights for women in other countries and yet we don't have equal rights for women in America." "It's time for all the women in America and all the men who love women, and all the gay people and all the people of colour that we've fought for, to fight for us now. Of course, it wouldn't be an Academy Award ceremony without the frocks! We've got snapshots of 12 favourite actresses and we invite you to give them a star rating out of five. Just click the link below - and if you want to be in the draw to win a double Gold Pass cinema experience, just leave your name and email details also.